EBT Accepted at NE Farmers Market! Helping to increase accessibility to fresh, local, healthy and affordable food for all consumers. • Find the EBT/Information Tent and decide how much you want to spend. • We will swipe your EBT card and give you wooden tokens in exchange. • You can use the tokens to purchase EBT eligible food items (listed below). There is no fee to use this service. EBT tokens are available in $1 increments. No change can be given for tokens, so purchases should be rounded to the nearest dollar. EBT tokens do not expire, so you can either spend them right away or save them for a future date. Tokens can only be used to purchase food at NE Farmers Market locations. Bonus: We double your first $10 in EBT each market day! We will match the first $10 in EBT once per market day! This dollar-for-dollar match is given in “Market Bucks” at the EBT/ Information Tent when you use your EBT card. Market Bucks can be used to purchase EBT eligible foods and are similar to the wooden EBT tokens, they just look different. There is no fee to use this service. You can return the next market day and double your first $10 again. 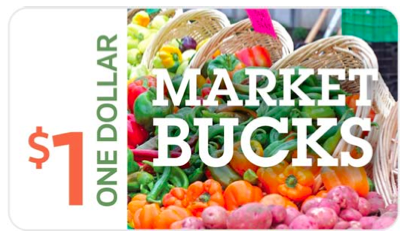 Market Bucks are available in $1 increments. No change can be given, so purchases should be rounded to the nearest dollar. Market Bucks do have an expiration date, so we encourage customers to spend these first. EBT (Electronic Benefit Transfer) is the electric debit card system that delivers food and cash benefits. Food benefits are distributed through the Supplemental Nutrition Assistance Program (SNAP), formerly the Food Stamp Program. “EBT” and “SNAP” can be used interchangeably. If you are wondering if you qualify for EBT/SNAP, you can contact the Minnesota Food Helpline at 1-888-711-1151 to find out more information. • Other food and food products for human consumption. In 2006, Midtown Farmers Market was the first farmers market in Minnesota to start accepting EBT. Each year, more farmers markets across the state and the nation are accepting EBT. These efforts are essential to make fresh, healthy and local food accessible to low income shoppers.